Did you see the B-2 Stealth Bomber fly over COTA near Austin? The Stealth Bomber flew over the crowd at Circuit of the Americas for a National Anthem performance during the IndyCar Classic race. AUSTIN, Texas — Attendees watching the IndyCar Classic race at the Circuit Of The Americas (COTA) on Sunday, March 24 got a special treat during the National Anthem. According to the official COTA schedule, there was an "aerial display" set to happen right after the National Anthem began. 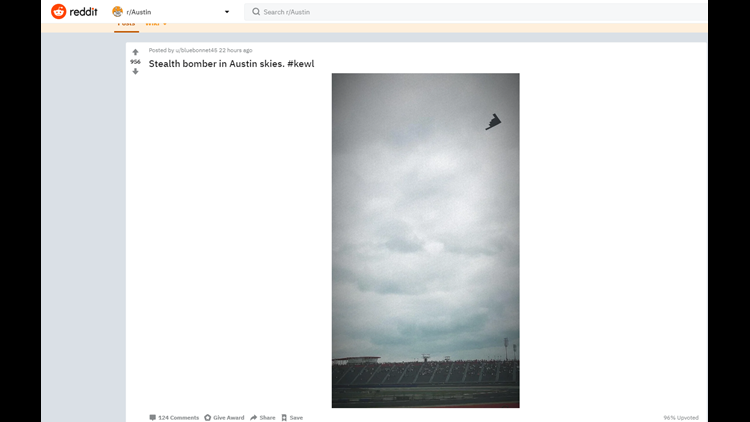 Reddit users took to the web to post pictures and videos of a B-2 Stealth Bomber flying over the stadium. A Reddit user shared this video of the flyover. The Northrop B-2 Spirit, also known as the Stealth Bomber, is a strategic bomber with stealth technology. It has a crew of two pilots, and there have only been 21 B-2s ever delivered to the Whiteman Air Force Base in Missouri since December 1993. A Twitter user also captured a video of the Stealth Bomber. Did you see the Stealth Bomber? Share your pictures with KVUE on Facebook, Twitter or Instagram.